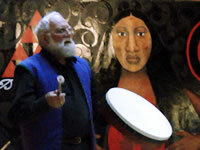 I offer online instruction and consultation for both beginning and advanced students of shamanism. We use phone, email and skype. "You have a way of teaching that bends the corners of 'reality,' so that those who are with you can see through to an infinity of possibilities." For three decades I have been taking small groups of people to special places I love. With sensitivity to local cultural and environmental concerns, we explore sacred indigenous traditions.